11/17: View of Old Town from Kitchen Window. Green Lights is Flanagan`s. Property Size 1,240 sq. 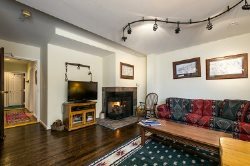 ft.
Unit A is a lovely 4 bedroom 3 bath condo with a fully equipped kitchen, fireplace, WiFi and cable television. There is a king size bed in the master bedroom and queen size beds in the other 3 bedrooms. There are two full bathrooms downstairs in each of the bedrooms and one full Jack & Jill bath upstairs.Please take a look at the floor plans and pictures. We are located on Park Avenue between 4th and 5th streets right in the heart of "Old Town". You will be steps away from from all of your favorite restaurants, bars and shops. furnished. Fully equipped kitchens, gas & wooden burning fireplaces, indoor & outdoor spas, and ski lockers. We offer free Wi-Fi, free covered parking, maid service every other day in winter and once in three days during summer and a well appointed free continental breakfast (winter only). Park City, Utah is host to a plethora of recreational, cultural and night life hot spots and with Salt Lake International Airport only 35 miles from The Blue Church Lodge you could be skiing or snowboarding by the same afternoon as check in. Cable TV, DVD Player, Flat screen TVs, On-site Laundry, Ski Lockers, Free Wi-Fi, Free Covered Parking, Huge Continental Breakfast (winter only), Indoor & Outdoor Spa, 4 Bedrooms, 3 Bathrooms, 1 King Bed, 3 Queen Beds, Fully Equipped Kitchen, Fireplace in Living Room. In Summer months the main level is air conditioned with 2 window units. The loft, 2nd floor does not have air conditioning. We have fans in every room if needed. For mor information please contact the manager, Louise at 435-649-8009.